In late 1991, it was highly unlikely that William Jefferson Clinton would ever be in a position to send White House Christmas cards. Few Americans had heard of the young, charismatic small-state governor with the impressive intellect and empathetic persona. But by the following summer, he had overcome low name recognition and personal scandal to be named the Democratic challenger to incumbent president George H.W. Bush. Bush’s approval ratings, which had hovered in the 80s in the aftermath of the Gulf War, had fallen dramatically after almost two years of bank failures, falling property values, and rising unemployment. He had lost support within his own party after reneging on a campaign promise and compromising with Democrats on a capital-gains tax increase. Clinton, an adept politician, campaigned on a promise to follow a centrist political course, return the economy to a shared prosperity, and revamp the nation’s ailing healthcare system. He prevailed in a three-way race against the incumbent president and independent candidate Ross Perot, winning 43% of the popular vote and 370 (of 538) electoral votes. In 1993, for the First Family’s inaugural White House Christmas cards, Hillary Clinton originally commissioned a pair of local artists to submit a design. Both of these offerings were rejected, the first because it too closely resembled the White House Christmas cards design sent by the President’s predecessor, and the second because it didn’t quite capture the essence Mrs. Clinton wanted. With Hillary Clinton having recently posed for Vogue magazine, the idea of using a photograph came to the forefront. On Veterans Day, New York photographer Neal Slavin took numerous shots of the First Couple and the White House grounds. In the end, a distinguished print of the President and Mrs. Clinton in the State Dining room was selected. In the background stood a tree decorated with American Crafts ornaments and the mantel, which was decorated by a local florist. An amber glow rose from the fireplace while the couple stood under a large portrait of Abraham Lincoln. American Greetings was selected as the company to produce the Clintons’ official 1993 White House Christmas cards. Inside the cards, a blind Presidential Seal was embossed with the printed message, “Our family wishes you and yours a joyful holiday season and a new year blessed with health, happiness and peace.” In all, 250,000 cards were produced on recycled paper, as well as 10,000 keepsake gift prints, which were given to members of the White House staff, amongst others. The Presidential Christmas cards were produced at American Greetings’ plants in Corbin and Bardstown, Kentucky. Workers at the Osceola, Arkansas plant produced 300,000 simple but elegant envelopes. On the back of the cards, the logos of American Greetings and the teamsters union were stamped. For 1994’s White House Christmas cards, the First Lady wanted to “highlight the house and the feeling that the house has during Christmas, which is really magical.” For the design, the Clintons hired Thomas F. McKnight, a contemporary romantic figurative artist known for his bold use of color. McKnight submitted fantasy prints of both the Red Room and Blue Room. Since the Blue Room was due to be renovated, the First Couple selected his Red Room print, which transmitted an enchanted and almost humorous look, rather than the overtly formal Red Room of previous administrations’ White House Christmas cards. Said McKnight, “I attempt to evoke with color, form, and imagination the essence of a place or thing without so much regard for historical accuracy.” In keeping with these guidelines, McKnight brought the Washington and Jefferson Monuments into view outside the room’s window. He removed 19th Century paintings from the walls and replaced them with a portrait of himself and his wife’s dog gazing over the hills of Middletown, New York, where he had once lived. The painting over the fireplace was replaced with a print of the White House and a Christmas tree was added (one had never stood in the Red Room before). On the mantel, the artist hung three stockings decorated with American flags. Under the tree were placed a new saxophone for President Clinton and a sled for Chelsea. On the table, a new tea set for Hillary was lain out and the First Cat, Socks, was pictured napping under a chair. Once again, the Democratic National Committee paid for 250,000 recycled-paper holiday cards to be printed by American Greetings, and for 1994, 15,000 gift prints were produced. The envelopes were addressed by computer, machine-stuffed, and stamped by meter. For the first time, anyone could view a color image of the card on the internet at http://www.whitehouse.gov. In 1995, the First Lady turned her attention to the renovation of the Blue Room. This redecorated chamber was chosen as the setting for the 1995 White House Christmas cards and Thomas McKnight was again commissioned to create the design. The prior year, McKnight had painted a more formal Blue Room scene which wasn’t used. For ’95, he composed one which exuded more warmth. Socks again appeared curled up under a blanket below a decorated tree. And Mrs. McKnight’s dog again made an appearance, relaxing behind Socks. As the artist does not duplicate existing paintings, James Madison’s portrait was replaced by a painting of Mr. McKnight’s Litchfield, Connecticut neighbor’s backyard, with the famed Sheldon Tavern (where George Washington once stayed) also appearing in the framed rendering. The Washington Monument is visible outside one window, under a trademark full moon. It was very important to First Lady Hillary Clinton that the newly refurbished Blue Room appear accurate in color and design. Samples of the drapery were actually sent to American Greetings to compare to their color proofs. For the season, the company printed 300,000 official White House Christmas cards and 15,000 gift prints. The deckle-edged design was burnished by a gold foil border and a blind embossed Presidential Seal. Impressed with his style, the Clintons again asked McKnight to produce the print used for their Presidential Christmas cards. For 1996, the Green Room would be used as the setting. This time, his rendition of Socks, lounging on a chair, didn’t go as smoothly as previous offerings. The artist received a call from a staff member on Air Force One, asking that he correct the snout, which some felt was too extended and fox-like. By that time, however, the print had already been sent to American Greetings, so someone had to adjust the snout on a computer. Once again, the artist added elements of fantasy to the room. The painting, which appears above the doorway, is McKnight’s original view of the White House from the South Lawn. Hung over the china cabinet is a portrait of the artist’s Litchfield, Connecticut backyard – provided as a symbol of typical, suburban life. The perspective had to be significantly skewed to make both windows appear in the photo, with the Washington Monument again visible through one. Swatches of the room’s drapes were again provided to American Greetings, to ensure that the accurate color was reproduced. All 300,000 White House Christmas cards were produced and ready for mailing by November 29th. Following that holiday season, the Monica Lewinsky scandal erupted and would prove to be by far and away the most trying episode of the Clinton presidency. Closing out a tumultuous 1998, and facing possible impeachment, the First Family tried to distract themselves in preparation for the holidays. Turning again to an interior setting for their White House Christmas cards, they decided to go for a more realistic, rather than imaginative feel. An aide contacted Martha’s Vineyard artist Ray Ellis, famed for his impressionistic seascapes, to do the work. Working against a tight deadline, Ellis arrived at the White House on September 29th and began photographing his subject, the State Dining Room, which was in the process of being redecorated. Ellis decided to paint a formal setting, with the table lain out for a holiday dinner. He said his most difficult task was reproducing the painting of Abraham Lincoln, which hangs above the mantel and the Theodore Roosevelt-era chandelier. Ellis adorned the table with floral arrangements and the Wilson china and hung evergreen bows above the Lincoln portrait as a fire blazed in the hearth. He quickly sent a sketch to the White House, and upon approval, composed a rich, cream-and-gold watercolor in a single day. The final design was approved on October 13th – just two days before Ellis left for a European vacation. For the sixth year, American Greetings was chosen to print President Clinton’s 300,000 White House Christmas cards and gift prints, and the cards were embossed with a Presidential Seal and a message reading, “May peace and joy be yours at the holiday season and throughout the new year.” The official Presidential cards appeared in many newspapers throughout the country, leading the 77-year-old artist to comment, “You couldn’t buy that kind of publicity. It proves that if you live long enough, good things happen to you.” He happily donated the painting to the White House collection. In 1999, having survived impeachment over obstruction of justice charges, the Clintons once again asked the esteemed artist to produce the art for their White House Christmas cards. Ellis requested that he be permitted to do a landscape, which was his specialty. It was agreed that the holiday cards would focus on the North Portico of the White House. Ellis immediately flew to Washington and got to work, positioning himself on the building’s north lawn this time around and sketching everything down to the last detail, taking note of the design of the windows and the lantern and adding three people entering the residence on a snow-blanketed night. American Greetings again reproduced the image on white card stock with a blank embossed Presidential seal and a message reading, “Our family wishes you and yours a blessed holiday season filled with treasured memories of past traditions and joy and peace in the new millennium.” The Presidential Christmas cards design was titled, “The White House, An American Treasure,” and the holiday theme for the year, Holiday Treasures at the White House, focused on honoring the rich traditions which had made America great – an appropriate sentiment at the turn of the millennium. In 2000, for their final White House Christmas cards, the Clintons again contacted Ellis, who toured the White House and grounds, taking photographs. The First Family was away, and Ellis even took a moment to have himself photographed behind the President Clinton’s desk in the Oval Office – a moment he said he’d never forget. At home, Ellis finished a series of sketches and sent them to the Hillary Clinton. The First Lady decided that it would be best for the card to depict a room they had not portrayed previously – the First Family’s second-floor living room. Ellis produced a watercolor of the Yellow Oval Room decorated with a tree and colored lights and poinsettias, with wrapped gifts and a toy soldier under the tree. The Washington Monument stood in full view through one window. At Mrs. Clinton’s request, he added First Pets Socks and Buddy to the left foreground of the painting. A sentimental greeting was added to the Clinton’s last White House Christmas cards, “With warm and treasured memories of our special time in the White House, our family sends you and yours our heartfelt wishes for a joyous holiday season and a new year filled with peace and good will,” along with printed copies of the President’s and First Lady’s signatures. For 2000, American Greetings produced a record 400,000 presidential Christmas cards. Sadly, for the First Family and Vice President Al Gore, that Christmas would be celebrated just days after the U.S. Supreme Court handed down its controversial decision delivering the 2000 election to Gore’s rival, George W. Bush. Bill Clinton certainly had his share of detractors, often based on his own personal flaws, or his ability to make only incremental improvements to the nation’s healthcare system, rather than the comprehensive healthcare plan he failed to pass. But during his time in office, the nation enjoyed eight years of relative peace (interrupted briefly by a successful 1999 air war to stop ethnic cleansing in the Balkans) and record prosperity. Clinton instituted policies which promoted free trade and a balanced budget. During his presidency, nearly 23 million jobs were created, with low unemployment throughout. The stock market reached unparalleled highs, due in large part to technological advances such as widespread use of the internet and the dot-com bubble. In 1999, the nation’s budget was balanced for the first time in 35 years. Once dismissed as a rube by his critics, the former little-known small-state governor would depart the office of president with a 65% approval rating. Very well written story. It will be helpful to anyone who utilizes it, including me. Keep up the good work – can’r wait to read more posts. Wow, I guess it doesn’t matter who you are – a Christmas card is a representation of you. It seems that the Clintons take as much time and effort as I do to send out the perfect holiday card! 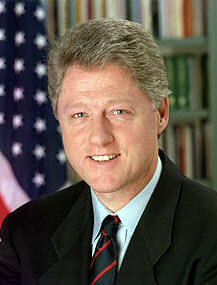 I have always been a big fan of bill Clinton as a president. He was a great president. I am surprised however that someone who can play the saxophone as well as Bill Clinton only ended up with a 65% approval rating.